Although the current conflict in Afghanistan stands as the longest war in American history, the US occupation of Haiti was longer, something that is often overlooked by most US newspapers when they report on the island of Hispaniola. In the same way that most American reporters are unaware that Haiti was occupied by US forces for 19 years, many are also unaware that the Dominican Republic, Haiti's neighbor, was twice occupied by the United States in the 20th century. The first occupation of the Dominican Republic, from 1916-1924, led to the creation of Rafael Trujillo, a brutal dictator that ruled for three decades and during whose first ten years in power the United States oversaw the country's customs. Even after Generalissimo Trujillo ordered the brutal massacre of 30,000 Haitians near the Dominican borderlands, he remained on good terms with his former friends, many of whom he had trained with during the US occupation of the island. Three years after overlooking genocide, the United States signed the Trujillo-Hull treaty, paving the way for Generalissimo Trujillo to take over 60% of the Dominican economy. Two decades after Trujillo-Hull, however, Generalissimo Trujillo was no longer useful in Washington's struggle in containing communism, and the Central Intelligence Agency, accordingly, furnished weapons to those who wanted to kill him, even inviting two of the assassins to the United States, providing them with moral support and training. Generalissimo Trujillo's assassination in 1961 did not magically keep communism away from the Dominican Republic, sadly, and the socialist Juan Bosch rose to power, threatening to piecemeal turn the the DR into another Cuba. In 1965, to save the Dominican people from socialism, the US began bombing Santo Domingo, and US troops helped cement the overthrow of the democratically-elected government of Juan Bosch, installing Joaquin Balaguer, who had been Generalissimo Trujillo's vice-president at the time of his death. After 12 years of brutal repression under the US-backed Balaguer regime, the Dominican people began their gradual transition to representative democracy, with the 1996 election of a Manhattan-raised technocrat and Juan Bosch disciple by the name of Leonel Fernandez representing for many the arrival of an independent, open era. Mr. Bosch's party, still in power today, has just been given another 1965, sadly putting an end to the illusion of Dominican independence. 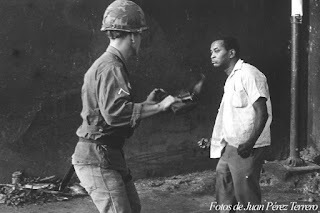 Unlike 1965, however, the United States doesn't need to send in US Marines and level shanty towns around Santo Domingo; visa imperialism is cheaper than bombs and bullets. This past week, US Ambassador Wally Brewster paid a visit to President Danilo Medina, informing him that Roberto Rosario, President of the Electoral Board, would lose both his diplomatic and personal visa, thus stripping him of the freedom to travel most of the world. The Electoral Board, an independent body whose president is selected by the Senate, is responsible for determining eligibility for citizenship and public office and of organizing the country's elections, making sure that the process remains free and independent. And now the Dominican Senate is slated to decide if Mr. Rosario shall stay in power, or if they should yield to US demands to replace him with someone who will dispense Dominican citizenship to the satisfaction of the US State Department. According to the large-circulation daily Diario Libre, the US State Department has threatened to take away the visa of two Dominican senators should they fail to replace Mr. Rosario. Exactly one century after first invading and occupying the Dominican Republic, the people are far from free of Washington's ruthless grip; it seems that the United States has simply developed better methods for controlling the small island-nation.